Here we go again. More kayak sailing attempts. 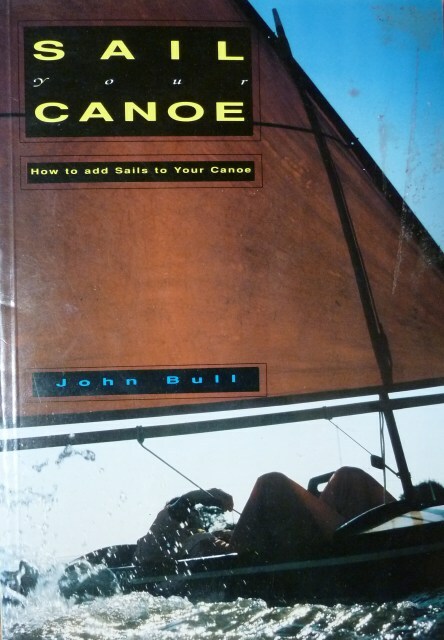 I was using my friend Tim Anderson's lug rig to test out kayak sailing for myself, but he took it back so it was time for me to make my own rig using John Bull's book, Sail your Canoe as a guide. I'm starting out with a lateen rig. 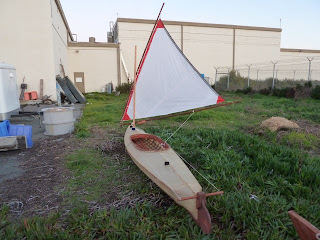 I have two kayaks with mast steps and fair beam, 32 inches and 30 inches. My approach to rigging the kayaks for sail is to hack away at the problem without any good idea of what I'm doing. Ideally, I would have done a design first. I know the basic principles like how big the sail should be, where it should be on the boat and so on. And I have some books that describe the different sailing rigs suitable for a small boat. But that's not how I did it, at least not this time around. I made a sail based on John Bull's book using materials I had available to me. The sail ended up being about 8 feet on a side because that was the length of spar material I had laying around, redwood from reclaimed deck lumber that my friend Steve had donated. I know that nobody ever uses redwood for boat applications. Apparently too soft and doesn't hold screws well etc. Still, there it was, lovely old growth redwood with tight grain and a marvelous deep color. It would have been a shame to not use it for something nautical. If you're going to cut down an old growth tree, better to use it for something less earthbound than fence posts or rain gutters. And friend Tim had donated a several damaged wind surfer kites from which I salvaged sail material for a new life as a kayak sail. 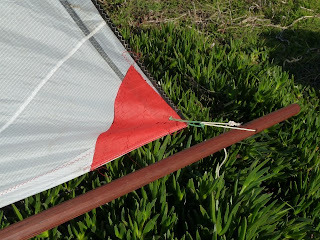 The kite construction is very ingenious and I tried to borrow some of the technology for my sail, like instead of punching holes in the edge of the sail and putting grommets in the holes using straps or string sewn to the edge of the sail to make loops through which I ran lines to attach the sail to its spar. We'll see how that works out. I mean, it works for now. The question is how it will hold up over time. 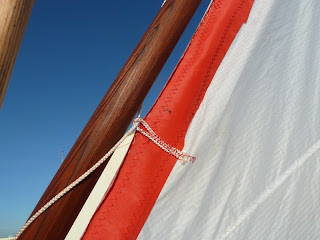 And here is the same approach used on the corner of the sail, a loop instead of a grommet. My guess is that grommets go back to the days of cotton sail and hemp lines neither of which were as strong as more modern materials. And here is the rig deployed on the boat. One thing I learned is to test out rig configuration back at the shop with the boat sitting on the ground. My old method was to haul everything down to the beach only to find out that things didn't fit together whereupon I had to haul everything back to the shop to "resolve the issues" as they like to say in the corporate world. The center of effort of the sail looks to be a bit far forward, ok for going downwind but in need of an additional sail in back to bring the center of effort back far enough where a leeboard deployed somewhere around the middle of the cockpit would do some good. The other problem with this configuration is that the mast step is a bit far forward of the front of the cockpit so that tending the sail is difficult. But we're learning. 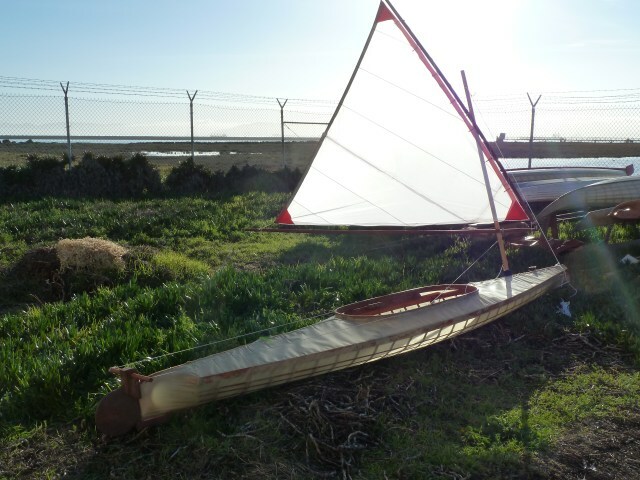 In any case, there the boat sits on its bed of ice plans dreaming of its impending outing with the new sail.